What, no link? How we can all go give him our money? A "light novel" is a translation of a Japanese term for a genre sci fi/fantasy novel written for light entertainment reading. 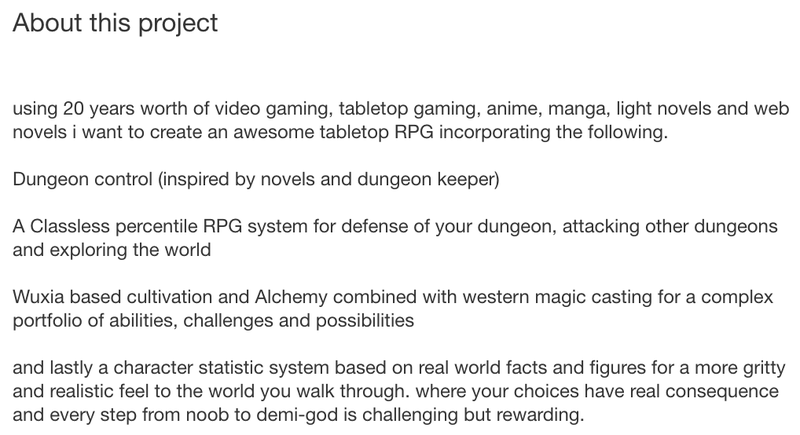 Dungeon Control - I assume, since he mentioned Dungeon Keeper, he means you build your dungeon and stock it with monsters to defend it against enemy incursions. Well, everyone has to pay their bills. Unfortunately, this attempt might not work (although it has netted $37 so far). No intelligent reader would ever take this seriously. 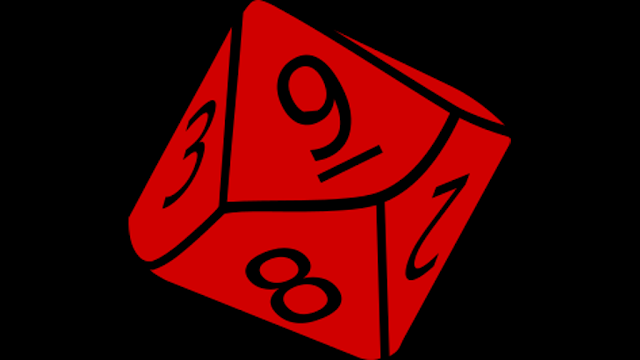 It might be more useful to focus on Kickstarter efforts that seem to be down with the community zeitgeist (and therefore raking in the pledges) but are still dodgy in some way. 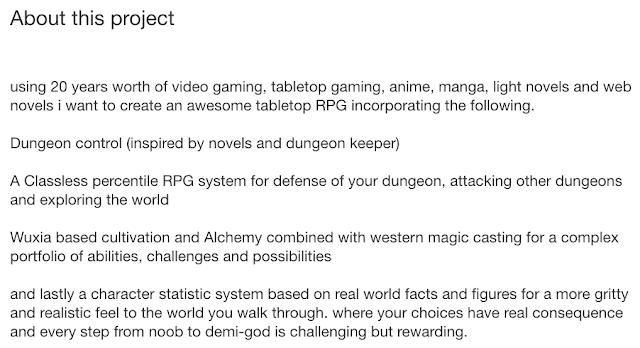 Ugh...so much "what not to do for Kickstarter". Frankly... Some legitimate Kickstarters that are indeed going to deliver (or have already) have lately had quite silly entry levels, especially PDF prices. And occasionally those high entry thresholds don't even cover stretch goals. Also, unclear wording for what nets you what is on the rise again. Light novels (a back-formation from the Japanese borrowing raito noberu) are what the pulps evolved into in Japan. They are relatively short (around 50K words) novels, usually including illustrations, but don't use the art to tell the story like manga do, typically printed on cheap paper in the A6 size (4.1" x 5.8"). While many are in the traditional SF/fantasy/horror type genres, there are also romance and erotica light novels, mysteries, and so on. Basically the full range of what went on in the pulps in the US up to the '50s or so. Also, light novels frequently, but not always, end up as serials, with some getting into the tens or even over a hundred chapters. The "Guin Saga" ran 130 volumes just for the main story, with some 22 side story volumes as well. Wot's rong with Ostraylian Inglish profishensie?